Nate and I both have the day off today which basically never happens and so we're working on some house projects today. Since we are focusing on finally checking things off our project list, this post is just going to show you the fabric we picked out for our chair makeover. I seriously considered using a patterned fabric to make over the chair, but since this is my first attempt at reupholstering and I wanted something that wouldn't look dated in a few years. 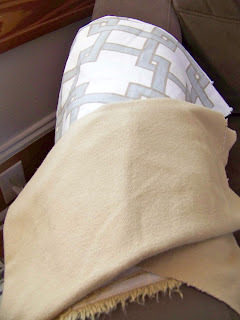 I ended up with this creamy beige fabric that I found as a remnant at a local fabric store. The store also had a poster letting you know how much fabric you need for different chairs and so after finding my type of chair, I bought the whole remnant which was just under 3 yards for $13. I also found this smaller patterned remnant that went so well with the chair fabric that I got half a yard to make into a pillow for the chair. That's the update for today! I hope you all have a great Easter weekend and enjoy today if you have the day off!